Rear end collisions, or “rear enders” are the most common type of accident on roads in Toronto, London and Peterborough. It’s said that between 70-80% of all car accidents in Ontario are rear impact or read end collisions. This happens when the front of one car, hits the rear of another car. Liability is rarely an issue in these sort of car accident cases. But damages, and the injuries to the accident victim always are an issue which insurance companies fight over. One of the most common injuries following a rear end collision is a whiplash injury. In doctors’ notes, you will often see the term “WAD”. This refers to a “Whiplash Associated Disorders”. A Whiplash Injury or WAD can happen when a person’s body jolts forward, then backward with such force as it causes injury to a person’s neck, back and shoulders. This sort of soft tissue injury is described as a whiplash injury. These injuries can lead to chronic pain, along with serious and permanent injury which prevents an accident victim from returning to work and leading a normal life. This sort of whiplash injury should not be overlooked. Another common type of injury which Goldfinger Injury Lawyers sees following rear end collisions are brain injuries. This can occur when somebody’s head strikes the windshield, window, side of the door, frame of the car door, roof of the car or dashboard following impact. This can also occur when the body is jolted forward, and then the head jolts backward and strikes the headrest. This impact to the back of the head can cause concussion or a mild traumatic brain injury. This can lead to memory loss, headaches, dizziness, loss of concentration, confusion, slurred speech, anxiety, depression and word finding difficulties. These problems should be brought to your family doctor’s attention right away following a rear end collision. These problems may not surface immediately. Often, the accident victim will be in denial that these problems exist, or operating under the mistaken belief that these health impairments will go away on their own without any need for intervention from a rehabilitation professional. Our law firm often sees friends, family members or loved ones making the initial call to explain the change in behaviour or health of the accident victim. 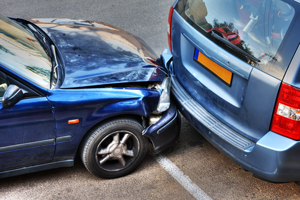 We would be pleased to assist you, your family member or a loved one with their rear end collision case. 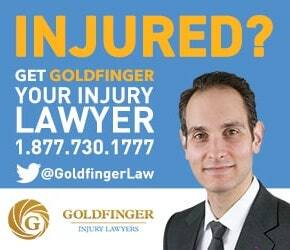 Call Goldfinger Injury Lawyers today for your free consultation with one of our car accident lawyers. You don’t have to pay any legal fees until your case settles. We will make sure that you get the results you deserve out of your case.